BEIJING, July 18 (Xinhua) -- China supports a political settlement of the Palestinian issue on the basis of the two-state solution, President Xi Jinping said Tuesday. 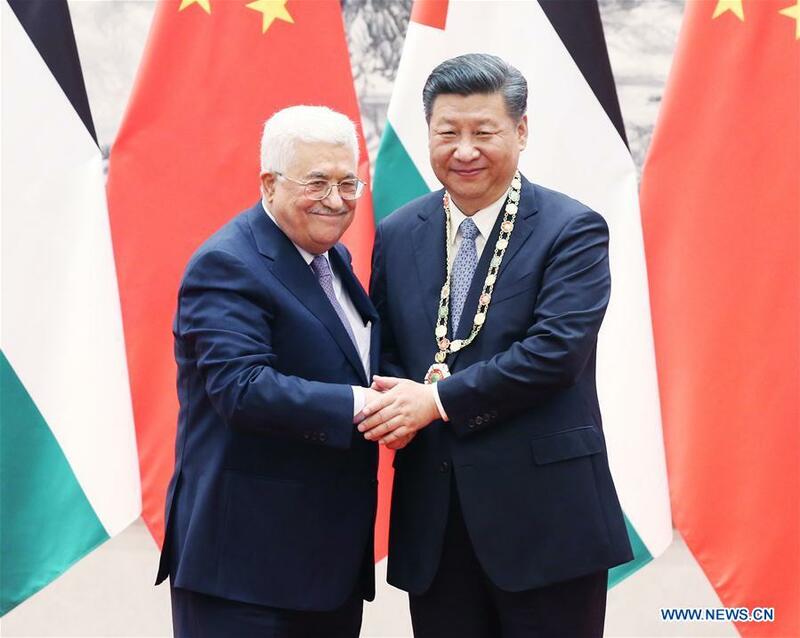 China supports Palestine in building an independent, full sovereignty state along the 1967 borders with East Jerusalem as its capital, Xi said in his talks with visiting Palestinian President Mahmoud Abbas. Xi said the UN Security Council Resolution 2334 should be effectively implemented, and all the settlement-building on the occupied territories of Palestine should be immediately stopped. The resolution, adopted on Dec. 23, 2016, condemned Israel's settlements on occupied Palestinian territory as illegal, and urged it to halt building. Xi said measures should be taken to prevent violence against civilians and peace talks should be resumed as soon as possible to accelerate the resolution of the Palestine issue. China is one of the first countries to support the just cause of the Palestinian people and to recognize the Palestine Liberation Organization and the Palestinian state, Xi said, calling both countries "good friends, partners and brothers." In 1947, the UN General Assembly adopted Resolution 181, which recognized the need to establish a Jewish state and an Arab state in the former British Mandate territory of Palestine. The 1967 Middle East war resulted in Israel's occupation of the West Bank, East Jerusalem, the Gaza Strip and the Golan Heights. The last round of peace talks between Israel and Palestine halted in 2014, mainly due to the continuing expansion of Jewish settlements on the occupied territories of Palestine. China will host a symposium on peace between Palestine and Israel later this year to contribute wisdom to resolving the Palestinian issue, Xi said. He said China is willing to participate in and support all efforts that are conducive to a political settlement of the Palestinian issue. "China proposes to launch a tripartite dialogue mechanism with Palestine and Israel to advance major projects to assist the Palestinian side," Xi said. Xi reiterated that China will, "as always," support the just cause of the Palestinian people to restore their legitimate national rights. Xi said China appreciates Palestine's adherence to the one-China policy. He said China will work with Palestine to give political support to each other, maintain high-level exchanges and promote cooperation in various areas. China regards both Palestine and Israel as important partners under the Belt and Road Initiative, he said. "China will support capable and qualified companies in carrying out investment cooperation in Palestine for mutual benefits and win-win results," according to Xi. The Belt and Road Initiative, proposed by President Xi in 2013, refers to the Silk Road Economic Belt and the 21st Century Maritime Silk Road. It aims to build a trade and infrastructure network connecting Asia with Europe and Africa, along and beyond the ancient trade routes. Xi said China will cooperate with Palestine in industrial park development, personnel training and solar power plant construction to help the country improve its self-development capacity. Xi called on both sides to strengthen exchanges in culture, education, science and technology, among others. Thanking China for its support for the just cause of Palestine, Abbas said Palestine will continue to support the one-China policy and China's reunification. Palestine admires China's achievements in economic and social development and is willing to have closer high-level exchanges with China and participate in the Belt and Road Initiative, Abbas said. Palestine spoke highly of China's constructive proposals on promoting a political solution to the Palestine issue and hopes to see China play a greater role in Middle East peace process, Abbas said. After the talks, the two heads of state witnessed the signing of cooperation documents ranging from diplomacy, economy and personnel training to culture. Abbas awarded the highest Palestinian medal to Xi for China's support to the just cause of Palestine and to pay homage to Xi himself. Thanking Abbas for the medal, Xi said it represents the importance Palestine gives to bilateral ties with China and the acknowledgement of China's fair stance on the Palestine issue. China will unswervingly push forward relations with Palestine and the Middle East peace process, Xi said. Prior to the talks, Xi held a red-carpet welcome ceremony for Abbas at the Great Hall of the People in Beijing. Abbas is on a state visit to China from July 17 to 20 at the invitation of Xi.